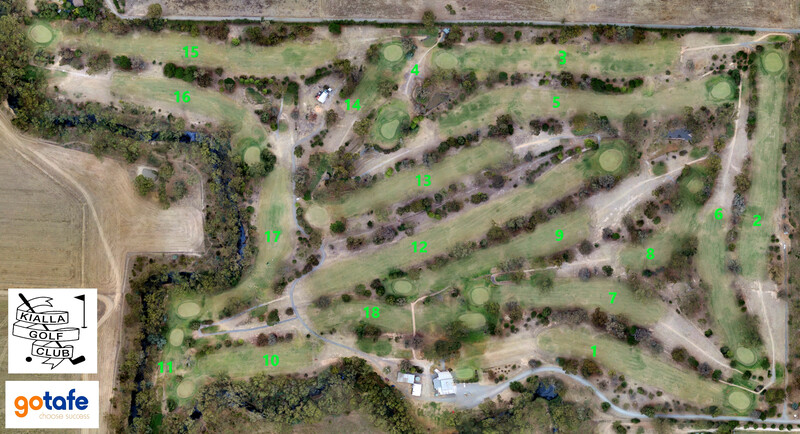 Welcome to Kialla Golf Club Inc | Kialla Golf Club Inc. - "come and play a round"
Kialla Golf Club is nestled along the picturesque Honeysuckle Creek, set in the quiet lands of the peaceful Kialla farming community. Situated 12km south east of Shepparton on Central Kialla Road, Kialla in the heart of the food bowl of Australia and the southern gateway to Shepparton. The 18 hole fully watered course has magnificent tree lined fairways second to none, and challenging greens, is an excellent spot for a relaxing round of golf with your friends. Kialla Golf Club has a fully licenced bar and well presented comfortable and friendly clubhouse. Why not enjoy our facilities including Hall Hire for your function or special event and our B.B.Q. area before or after your round of golf. Visiting members from other clubs who hold a current handicap are most welcome to join in our competition events. Kialla Golf Club Inc. is also a member of GOLF Link. Green fee players are most welcome and will find our extremely moderate green fees to their liking. 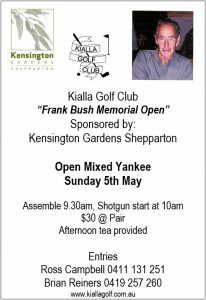 The friendly folk at Kialla Golf Club look forward to welcoming you.